본 연구는 해방 이후인 1949년 8월에 출간된 ࡔ武藝圖譜新志ࡕ를 중심으로 당대 이 책의 저술 배경과 무예사적 특성을 살펴보았다. 이 병서는 일제강점기 劍道와 銃劍道를 수련한 무예인 郭東喆이 저술한 것으로 식민지 ‘조선’에 보급된 劍道(Kendo)의 한계점을 극복하기 위하여 만들어졌다. 구체적으로 저자인 곽동철은 이 병서의 발간을 통해 민족의식의 고취와 상무정신 계승으로 국가발전에 이바지하고자 하였다. 이를 위하여 일본에서 완성된 劍道(Kendo)의 명칭 및 수련법과 경기방법 그리고 복장까지도 자국화시키려는 노력을 이 병서를 통해 진행하였다. 예를 들면, ࡔ武藝圖譜新志ࡕ에서는 기본적인 검 겨눔세를 전통적인 자세명으로 바꾸는 것을 시작으로, 일본식 치마바지인 ‘하카마’ 대신 전통 사폭바지와 행전을 착용하고 저고리를 응용한 전통 수련복을 활용하였다. 또한 경기법에서도 ‘발걸이’와 ‘相撲’과 같은 새로운 수련법을 추가하여 劍道(Kendo)와의 차별화를 시도하였다. 특히 이 병서의 말미에 정조대에 완성된 군사무예인 ‘무예24기’를 정리한 ࡔ무예도보통지ࡕ에 실린 본국검, 쌍수도, 예도, 장창 등을 부록을 싣고, 책 명칭도 유사하게 작명하였다. This study examined the background of the book and the historical characteristics of the martial arts centered on the ࡔMuyedobosinji(武藝圖譜新志)ࡕ published in August 1949 after liberation(1945.8.15). This book was written by Kwak Dong-chul, a martial artist who trained Kendo(劍道) and Gun-Kendo(銃劍道) during the Japanese colonial period, and was made to overcome the limitations of Kendo, which became a part of Japanese imperialism education. 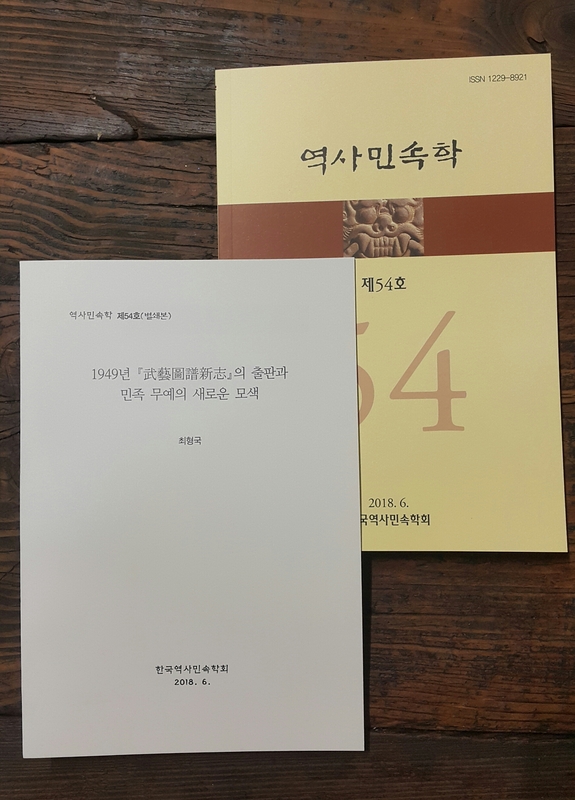 Specifically, Author Kwak Dong Chul contributed to national development through the promotion of national consciousness and martialism succession the publication of this book. For this purpose, the name and training method of Kendo completed in Japan, the method of competition, and the effort to nationalize the costume were conducted through this book. For example, in this book, starting with changing the basic attitude name of sword to traditional posture name, the traditional Japanese style skirt pants ‘Hakama(袴)’ was replaced with a Korean traditional pants and a traditional dress suit using ‘Chogori(저고리)’. Also in this book, we tried differentiation from Kendo by adding new training methods such as “Balgeol-i(발걸이)” and “Sangbag(相撲)” in the competition method. Particularly, at the end of this book, Bonguggeom(本國劍), Ssangsudo(雙手刀), Yedo(銳刀), and Jangchang(長槍), which are listed in ࡔMuyedobotongji(武藝圖譜通志)ࡕ, which summarized the ‘Martial arts-24ki’. ࡔMuyedobotongjiࡕ, Kwak Dong-chul, Kendo, Japanese imperialism education, Japanese colonial period, Korea Kumdo Association, Intenational Kendo Federation, ࡔMuyedobotongjiࡕ, Martial arts-24ki, History of martial arts.